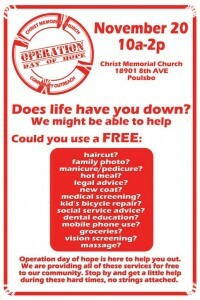 I wish that I could attend Operation Hope this Saturday but I wanted to get the word out about this. I think it is awesome that Christ Memorial Church is hosting this wonderful event and that people are donating time, money and resources to help Kitsap people with hope. Hope comes in many forms so if you know someone who needs a spirit lift -tell them about this, maybe even offer a ride or your presence to go with them. I think it is so appropriate to have this during the month of November. Everyone needs a little hope- so share this hope with a friend or neighbor.